Here's an entirely plausible scenario: you are a human who enjoys video games, owns a PC and likes Star Wars. You've heard forever that Tie Fighter is something you should play, but a combination of necessary fiddling and the fact you couldn't actually buy it anywhere mean that you've never tried it yourself. This week, everything changed. For the first time in well over a decade, the game - along with its predecessor X-Wing - became available to buy. And what's more, it's a copy of the game that you can download and just play, no tinkering needed. This review won't tell you whether this game is any good. Of course it's good. It doesn't routinely end up on "best video game of all time" lists for nothing. Instead, then, I'm just going to tell you why it's good, and if given the choice (let's say you've only got $10 instead of the $20 needed for both), why you'd probably want to get this before X-Wing. Which, you know, also ends up on a lot of "best video game of all time" lists. I love X-Wing. It's not just a great space shooter, it's also a great Star Wars game, doing a better job than pretty much anything other than Dark Forces in making you feel like you were actually inside George Lucas' cinematic Star Wars universe, not playing through some game studio's distorted vision of it. Tie Fighter does all of that, it just does it better. It's a ruthless space shooter where large battlefields, sprawling engagements and shifting objectives mean victory has to be earned, and a moment's indecision or slowness can cost you the entire game. But where in X-Wing this design often felt punitive and unfair, in Tie Fighter you get the feeling Lucasarts had learned from its mistakes, and that any failure - even if it came 28 minutes into a 30-minute mission (that didn't have checkpoints) - was solely down to you. Why? Because Tie Fighter, like X-Wing, wasn't just about flying around and shooting things. At the heart of the experience across all the games in the series (there would be two more, the multiplayer X-Wing vs Tie Fighter and X-Wing Alliance) was one of the most effective mechanics in video game history: energy management. Each ship you fly in the game has a finite amount of energy that can be distributed across its systems. You can assign a degree of it to your weapons (affecting how quickly your lasers recharge after firing), your shields (affecting how quickly, if at all, your shields regenerate after taking a hit) and your engines (affecting how fast your ship could move at top speed). What makes it so important is that it's a zero-sum game. Divert energy to your weapons and either your shields will suffer or your speed. So every situation you face in the game becomes more than just a test of reactions and shooting, it becomes strategy. Some fights will need more shields, others might need more firepower, the best (and most frantic) will usually require you to urgently switch between them as they ebb and flow. In X-Wing, you had to juggle this and mission design that would often make success physically impossible. Tie Fighter is more generous with its demands of the player in this regard, meaning that when you fail - and you will fail, often - it's just your fault. You could have gone faster, or fired more rounds, or defended yourself a little better. You had the tools at your fingertips to adjust your craft to the battle, you just must not have used them properly. Try a different approach next time, hot shot space pilot person. In most Star Wars games, you're playing as the good guys. The Republic, the Rebels, doesn't matter, the forces of evil are largely nameless, faceless and exist as cannon fodder. Not in Tie Fighter. Playing as an Imperial pilot, you get to see the Empire at ground level, wandering its hallways, using its tech and meeting its officers as colleagues, not targets. This alters the tone of the entire game, not just outside of missions, but in them as well. In X-Wing, playing as a Rebel pilot, you're constantly up against it, outnumbered, outgunned and on the run. In Tie Fighter, you're the hunter, not the hunted, and that feeling of superiority and control makes many missions - especially at the beginning of the game - feel almost relaxing (though this is compensated for somewhat by the fragility of some Imperial craft compared to the bulkier Rebel ships). This has a weird effect that to this day I wonder if George Lucas was ever really cool with. Painted in movies as the ultimate bad guys, utterly irredeemable, in Tie Fighter you see that there are good guys and bad guys in the service of the Emperor, just like there are in any organisation (yes, I know the parallels). I won't go into much more detail about this split, since it plays a part in the story, but I remember clearly that when I first played the game in 1994 it forever changed my outlook on the Empire, regardless of the media I was seeing them feature. It's amazing how well this game holds up. Yes, it can be a bit gross visually in places (the 1994 edition's polygons are muddy and the 1998 edition has some icky menus), but in terms of how it feels, how the missions play out, it doesn't feel - in the way 90s PC games often do - that you're playing something overly-complicated, obtuse or confusing. You get dropped into a huge space battle, you fly around with smooth-as-butter controls, you make use of a dynamic but incredibly simple energy mechanic, you shoot some stuff, you move on. It is, for what the genre requires, almost everything it needed to be. It gave you enough systems to blow stuff up, not enough to confuse you, and then made the combat as fast and exciting as it needed to be. I think that's the reason, above all others (even the decline of the joystick), that the space combat genre went away. 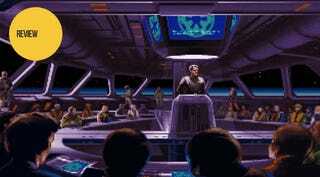 Why Wing Commander focused on presentation, not gameplay. Why Tie Fighter's sequel, X-Wing Alliance, is never mentioned in the same breath. Why we haven't seen any major space shooters in over a decade, and why the ones we're seeing now are either pegged to larger systems like trading or peripherals like Oculus Rift. Because Tie Fighter was pretty much perfect. It was everything a space shooter ever needed to be. And still is.